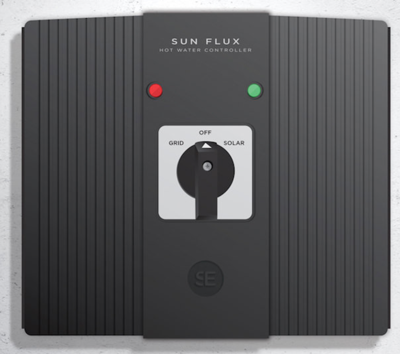 The Sun Flux is a box of electronics with one function: heating water with solar electricity. I recently wrote about solar hot water diverters1 which use surplus electricity from an existing rooftop solar system to heat water. Another option for heating your water with solar electricity is to use dedicated solar panels. These panels put all their power directly into the hot water cylinder’s heating element. When the water hits its temperature set point the panels are deactivated. If there is not enough sun, you can use grid electricity to boost the heating. The grid power is kept on a separate circuit – so the panels never connect to the grid. This is what the ‘Sun Flux’ hot water controller does. This device uses dedicated, off-grid solar panels to power a conventional electric hot water cylinder. Your regular household solar system can continue to send its surplus solar electricity into the grid for a feed-in tariff. Because it’s off-grid you can install panels to power the Sun Flux even if your Distributed Network Service Provider (DNSP) won’t allow you to add any more on-grid solar capacity. As a safety precaution, standard rooftop solar will shutdown during blackouts, but the Sun Flux will keep working and heating water as long as the sun shines2. You will waste some of your solar capacity. Once your hot water reaches its maximum temperature, the solar electricity produced by the Sun Flux’s dedicated panels has nowhere to go. It can’t power your home or earn a feed-in tariff. In warm climes, if hot water use is low the Sun Flux can supply all of a household’s hot water using solar power. But most Australian homes are below the sub tropics, and in winter they will need to import grid power to supplement the panels’ output3. There are two versions of the Sun Flux. The first version is just called Sun Flux, but I will call it Sun Flux 1 to try to avoid confusion. It has a switch for manually changing a single-element hot water system to grid power when a boost is required. Does anticipating when your cylinder will get too cold hours before it happens, then running to flick a switch, then remembering to switch it back to solar sound stressful? Then you probably want to forget about the Sun Flux 1 and look into the Sun Flux 2. The Sun Flux 2 is designed for connection to the bottom element of dual-element hot water systems. If the Sun Flux isn’t able to adequately heat water with solar the top element will activate automatically using grid electricity. The Sun Flux is installed by Array Energy who are located on the Gold Coast in Queensland and in Newcastle, New South Wales. They will fully install the Sun Flux and four 290 watt solar panels for $2,490. Sharp Energy Investments is an Australian company that, as far as I know, has nothing to do with the Japanese Corporation Sharp4. The elements in electric hot water systems use AC power, which is what the grid supplies. But the Sun Flux is not an inverter and does not change the solar panels’ DC power into AC power. Instead it changes the DC into a form the element can use to produce heat. Because of this, the Sun Flux can’t be used to power anything other than a heating element. The subheading said it in big type and I’ll say it again in little type — the Sun Flux can only be used with 2.4 and 3.6 kilowatt heating elements. While the Sun Flux can have more than 1 kilowatt of panels attached to it, the unit itself can only supply a maximum one kilowatt to a hot water system. This is not a lot and only enough to raise the temperature of a 250 liter hot water system by 3.4ºC an hour at full power. Because of losses resulting from heat, dirt, and other factors, its solar panels may rarely, or possibly even never, allow it operate at its full one kilowatt capacity. Sharp Energy Investments says the Sun Flux is up to 96% efficient. Unfortunately, this is not very useful information. My car can be up to 99.9% efficient at converting (potential) energy into (downward) movement if I drive it off a cliff. But in normal operation my car is only about 20% efficient. Details are important. But I will assume its average efficiency is not too far off 96%. We can be sure it doesn’t average 2% on account of the fact it actually works. If you have a two element hot water system the Sun Flux 2 can be attached to the lower element in the hot water tank. The upper element is left connected to the grid and set at 10 to 20ºC lower. This way, if the Sun Flux is unable to do an adequate job of heating water, the upper element will come on. So if the lower Sun Flux element is set at 65ºC the upper one could be set at 45ºC. When it’s not stinking hot an average shower temperature is 41ºC. Update 26 August: In order to control potentially fatal Legionella bacteria and other dangerous microorganisms, the upper element may need to be set to a minimum of 60 degrees, or the hot water system will need to be able to automatically raise its temperature to at least 60 degrees every 3 days or so if the Sun Flux is unable to do so. If the hot water system can’t automatically raise its temperature, this limits the maximum temperature for the Sun Flux connected bottom element for hot water systems that lack tempering valves that reduce the risk of scald injuries by limiting the temperature of water that comes out of taps to 50 degrees. The lower the temperature difference between the upper and lower elements, the more likely it is that grid electricity will be used at times to heat water. Roughly 20 to 30% of homes have 2 element hot water systems, with them being more common in colder parts of the country. If a hot water system only has one heating element, it can be used with a Sun Flux 1 which has a switch that can be manually used to change a hot water system to grid power. 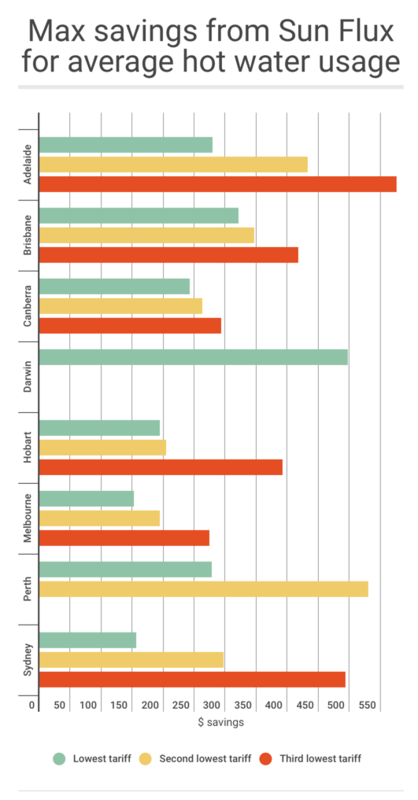 The majority of Australian electric hot water systems are on controlled load tariffs5. These allow households to pay less for electricity powering their hot water systems. The disadvantage is this power isn’t always available and is often only provided in the early hours of the morning6. 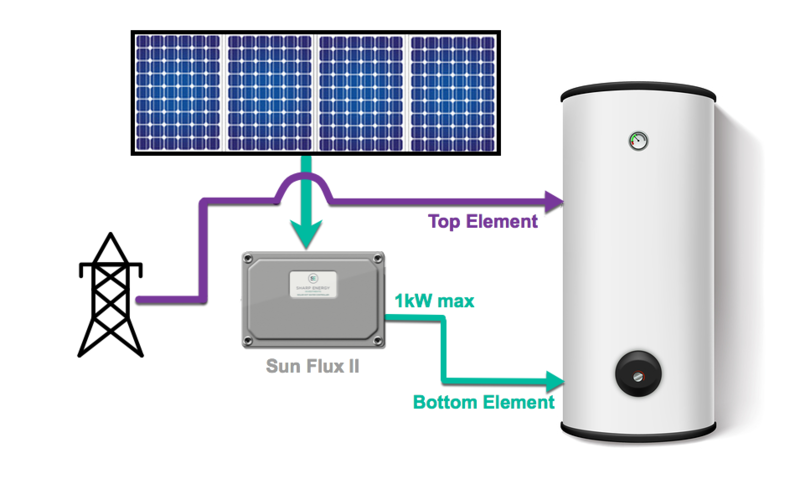 The Sun Flux allows households to keep their controlled load tariff. 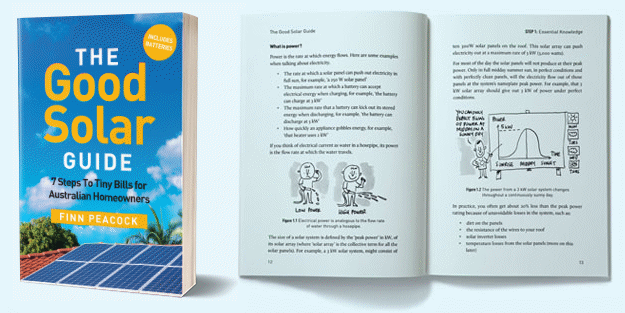 If you are relying on a manual switch to provide grid power to your hot water system when solar electricity isn’t sufficient, then having a controlled load tariff will clearly complicate matters. Array Energy told me they normally install the Sun Flux with four 290 watt panels for a total of 1.16 kilowatts of PV capacity. This is not enough PV for a typical household to get 100% of their hot water from solar. In Brisbane, a typical two person household could potentially heat all their hot water with solar electricity with 1.16 kilowatts of panels in summer. As for winter, if we assume the Sun Flux operates at an average efficiency of 95% then with north facing, unshaded panels, in June, it will only generate a daily average of 3.8 kilowatt-hours. That compares to the 4-5 kilowatt-hours a day they’ll typically need for water heating. So pretty close. But in Melbourne in June it is a lot colder than Brisbane and solar production is much worse. In June 1.16 kilowatts of panels will only produce an average of 2.6 kilowatt-hours a day. That will only provide a third of the typical winter hot water needs of a two person household in Melbourne7. Sharp Energy Investments says the Sun Flux can have from 2 to 6 panels. If 300 watt panels were used then 6 of them would come to 1.6 kilowatts. This would definitely reduce the amount of grid electricity required, but any electricity generated above the Sun Flux’s maximum power of 1 kilowatt will be wasted and for modest users of hot water the extra panels are likely to provide little or no benefit in summer. Adding more panels to a Sun Flux will increase its cost. Because the Sun Flux’s capacity is only 1 kilowatt a maximum of 1.33 kilowatts of its solar panel capacity can receive STCs that lower the cost of solar8. Fortunately, because the Sun Flux panels are off-grid, the 1.33 kilowatt limit can be exceeded, you just can’t claim STCs on any panels over the 133% limit. With on-grid solar there is a risk that no STCs at all will be given if your panel array totals over 133% of the inverter capacity. If it is very reliable, why does it only have a 2 year warranty? Personally, I would require a significantly longer warranty than this for any kind of solar hardware. Hopefully Sharp Energy Investments will improve on it soon. Array Energy says it is possible to extend the warranty to 5 years. The average Australian home without gas9 uses around 6,000 kilowatt-hours of electricity a year, so 40% of that would be 2,400 kilowatt-hours. Even with north facing panels and zero shade, if the Sun Flux’s recommended 4 panels total 1.16 kilowatts, then on the average Australian roof they will provide around 1,700 kilowatt-hours a year to the hot water system. This is 28% of the average household’s electricity consumption. With six panels totaling 1.6 kilowatts on the average roof the Sun Flux will only provide 2,200 kilowatt-hours to a hot water system. That is 38% of average household electricity consumption, close to 40%. So does the 40% figure scrape by as being legit? No it doesn’t. This is because the average household does not use 40% of its electricity consumption to heat water. The figure is around 25% for homes with electric hot water systems. The fact that the average Australian household heats their water on a cheaper off peak/controlled load tariff makes it worse. Let’s say your household is a large user of hot water and so electricity provided by the Sun Flux’s panels never goes to waste. In addition, they face north and are completely unshaded. Here in Adelaide it is possible to have a controlled load tariff as low as 15.5 cents a kilowatt-hour. On this tariff the Sun Flux would save $275 a year on electricity bills. If the controlled load tariff was a more typical 24 cents then it would save $432. For average hot water usage, the maximum amount of savings possible from installing a Sun Flux in Australian capitals are shown below. I’ve shown the three cheapest tariffs for heating water in each city. The costs of controlled load tariffs are shown where available10. Maximum savings per year for average homes. In reality the actual savings are likely to be less than this. Especially in sunnier locations, as not all the solar electricity the panels can produce is likely to be needed in summer. According to my calculations the highest return possible is in Adelaide if you are heating your water on a standard tariff of 32c per kWh. But if you are in SA and have your hot water cylinder on a non-controlled tariff you’re off your trolley. Call up your retailer immediately and get a 2nd meter installed. The highest realistic return is in Perth. While not as ridiculously hot as Darwin, it is still a very warm city. But assuming a Sun Flux will allow a Perth household to save $531 a year, the simple payback for a $2,490 installation is 4.7 years. That is more than twice as long as its 2 year warranty. But if you feel lucky and assume the Sun Flux will last for far longer than its warranty, provided your hot water use is high enough, it could pay for itself after about 5 years. …is not true on any of the usages and tariffs above. then you may find the Sun Flux 2 to be an intriguing option. But if you have typical hot water usage and are on a typical tariff I can’t see how the payback will be 2 years. I looked at an option similar to this (a KIWI co does a similar thing, with no mention of our latest Kiwi parliamentarian!). My take on the subject is that one is better to use excess Grid export from the PV (using a smart diverter, in my case a self-built one from , which of course is not for everyone because it is a kit that needs a LOT of expertise. To my mind, if you oversize your PV system, then divert to HW you save on many fronts. The excess panels do not add appreciably to the system cost, even the commercial diverters are not that expensive, & on a new build there are savings because the plumbing runs are shorter, you can place the HWS near the wet areas, or even run separate systems on a big house. The maintenance costs are lower because you have a simple, cheap HWS, the PV system is all maintained together, & the diverter box should be reliable with modern electronics. In my case, I am building 2 home units for persons with a disability. I am not even intending to use the oo-peak connection because I have installed 13Kw of panels on a 10Kw inverter (with 5KW export limit), so have Solar PV to burn! THe total cost of the PV + HWS(s) still did not exceed the cost of reasonable PV + ‘Wet’ HWS, in fact in my case was probably a saving. All this is keeping in mind that the use of Solar PV + resistance heating is incredibly inefficient (I reckon possibly 20%, so it will possibly use 15KwH/day for 2 people) it is still economical! I’m in the country with a LPg instantaneous hot water wall mounted system. Could i put a Tank b4 the system and pre-heat the water using PV? Sometimes the water from the outside rain tanks can be 2 Deg. Even if it doesn’t make it to 50 Deg , any increase in temp helps with the gas bill. You might be able to adapt a solar system usually installed to heat a pool. For what its worth…. there are many solar water heaters that use LPG instant heaters as a back up. Water is heated directly in the tubes and or panels or via heat exchange and stored for use in a hot water cylinder. If hot water is called on and temps are below the temperature cut off for the instanat gas unit the gas unit fires up and completes heating up to 75C. I see no reason why the same could not apply to a preheat tank using a sun flux. You would need a backflow prevention and isolation valve between the two cylinders. This may not work with gravity fed cylinders but should work with mains pressure. There is technically no problem with what you have suggested, but to control Legionella and other micorganisms, hot water systems have to reach a temperature of at least 60 degrees at regular intervals. So your preheat tank would need to have grid power to ensure this can be done, or another source of heat. While the water would get get heated by the LPG instantaneous hot water system, it wouldn’t be sufficient for it to be considered safe. I have just updated the article to mention Legionella. Swimming pool solar heaters do not have holding tanks you could simply have it as a pre-heater what begs the question what do you do out of sunlight hours. I really enjoy reading your articles and while not directly related to solar I would appreciate your thoughts on the role out of Smart Meters in Queensland. My supplier AGL informs me that I will be switched to a Smart Meter next month unless I refuse the offer. From my research AGL has a subsidiary called Active Stream (AS) who both supplies meters and collects data. As AGL or AS and not Energex are supplying and installing the meter my concern is that this is an attempt to lock me in to maintaining a contract with AGL. With new comer Alinta Energy offering a 25% early payment discount versus the 10% for AGL it is a no brainer to switch to them. Alinta told me that they obtain the meter data from Energex and were vague about whether they could access the meter data from AS. I have read online of AGL customers in SA who had a Smart Meter installed and then found that other energy providers were unable to access the data. What is your opinion? I would definitely ask for the conditions of accepting a smart meter in writing, including whether or not there are any restrictions on changing to another retailer. I would also check if there are any fees involved. I have heard of people in NSW being offered a “free” meter and then being charged monthly rental for it, which is not what the word free means. If getting the smart meter will restrict your options or result in fees, you can see if you can get a better offer from another retailer. Telling AGL you are looking for a better retailer may result in them changing their tune, but there is no guarantee. Thanks Ron, I will certainly try to tie AGL down with regards to my ability to change providers but I do not fancy my chances of getting something in writing when communicating through a call centre. Just refuse the smart mater, I did in NSW but they still installed a smart meter, but due to my obstenance I won with help from the ombudsman & the Minister for energy and they had to install accumulation meters. In reference to the article, I am near Port Macquarie with 30 evac tube & home made PV diverter & beut cheap chinese controller that works a treat. Ronald, I have even had the contolled load 1 disconnected. -hmmm- what on this earth is wrong with using quick recovery solar water heating panels to heat water directly-WITHOUT USING ELECTRICITY AT ALL- SOLAR EDWARDS [now rheemed and hopefully still made using copper piping/stainless NON RUSTING steel and maybe another firm called BERKLEY made these of materials that DO NOT CORRODE just out of warranty period of 2.4 years that seems to be done now. Attach two panels to a 305 litre STAINLESS STEEL tank- End of problem forever- if this is not being done any more and why on earth not? We have a split solar hot water system. The booster element is connected to the general tariff with access to that power source controlled by a $200 24 hour timer switch installed in the Power Box. It is configured to Switch access to power On during PV Production and Off when there is no PV production. The circulation pump is always switched on and wired to its own general tariff power supply. Our Enphase system PV Production services household consumption including the hot water booster and circulation pump, pool pump and storage and what is not consumed or stored is exported. The setup for other types of hot water systems might need a different strategy to maximise the use of Solar Production. We do not subscribe to any time of use tariff we control everything like the hot water and pool pump with timers. The only cost we have in relation to hot water is what is consumed by the circulation pump out of sunlight hours which is negligible as the temperature of the water on the roof is unlikely to hotter than that in the holding tank. Sometimes a response is best told with the use of images supported with an explanation. You known what they say a picture is worth 1,000 words. I hear you Ant! We’ll get a plugin installed next week to allow commenters to upload pictures. As I have previously stated… I have 5kw solar and a 1.3Kw 310 litre heat pump HWS on a timer that comes on at midday when air is at its average hottest for next 2 hours and solar is at a peak. Most days it only takes 2 hours ie 2.6Kw of energy. That equates to ~8Kw of conventional energy. I have no booster element connected and in 3 years have only once had to ‘bypass’ the timer in the sub board- that was with 3 families staying over xmas. Heat pump is now 9 years old and nothing has gone wrong……..yet! Great read Ron, always happy to see you debunk ridiculous ROI claims, even when having the odds stacked in their favour. After your recent string on hot water diversion blogs, it would be nice to see your opinion on catch power. Some comments on the previous posts, but not to start a flame war! To the Gas guy: I would suggest a solar tube type pre-heater. The Chinese ones are available from about 50L to 300+.. The one I would suggest is the one that uses a heat exchanger, so the water flows straight through the exchanger pipe, so the likelihood of bugs growing is reduced (when the water is below 60 deg C). Keep the feed pipe short between the tank & the Gas heater to reduce losses. To the other feedbackers, I agree there are more efficient systwms. In my case, I could fit the heaters close to the wet areas to reduce heat loss, then way oversized my system to cover the losses in energy transfer. The savings come because it might add $1500 to add 1.5Kw to a Solar system at install, but the savings on plumbing installation to a ‘wet’ HWS would have cost far more than the extra PV + the electronic diverter. When you consider that Off-peak also adds to the install costs, & there is a standing cost, I will wear the additional cost of heating water inefficiently occasionally at full rate (when the solar fails). Soon we will all be on TOU, & then I will fit a timer to turn the service on at low-rate times for the odd occasion it is necessary. To the Heat pump users, the running cost is low & efficient, but you rely on a very mechanical device (where early ones were also noisy). Not the sort of thing that might be able to be installed at an optimum HWS location, then when they do fail, they are expensive. I say that one of two options is a far better investment than the snake oil proposition. Option 1: if solely to be used for water heating, the $2500 would be better invested ib a rooftop solar water heater. I do not know how much a 300 litre solar water heating system would now cost to be installed – it would depend on location, and brand, but, I believe it would be a far better investment I note that Solar Edwards was taken over by Solahart or Rheem, and those two companies may be one and the same, now, anyway. But, spending the $2500 on getting a solar water heater system installed, is far better investment than the snake oil proposition. 2. Simply spending the $2500 on getting a rooftop photovoltaic system installed, gives far more benefit than the snake oil proposition. $2500 probably gets a 3kW rooftop photovoltaic system installed, now, or, at least, a 2.5kW system, which would give much more usable electricity, for all use throughout a household, and, a rooftop photovoltaic system generally comes with a much more substantial warranty. Mark Head is on the right track on this subject. The most energy efficient and cost effective water heating solution is by Solar Thermal technologies, rather than Solar PV electrical technologies, especially if a few boxes can be ticked off (temp range of location for example being one). Simple ground mount designs are the best, for example a well insulated (PU) stainless steel circular tank 700 x 1600 mm inside a 1000 x 1000 x 2000 steel container is a good size to couple to 4 sq meters of solar thermal flat panel collectors. 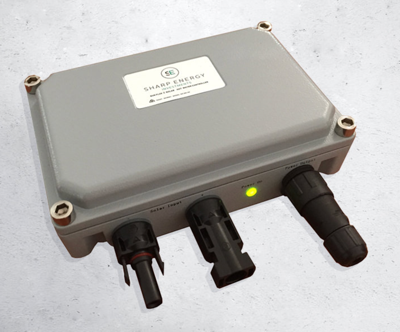 Any solar PV panel above 250 watts can also be mounted on the same frame and DC coupled to 2 x 12 V 150 AHr VRLA batteries (series) which powers a multi purpose pressure pump (recirculating and HW pressure) and some simple sensors and controls. The outcome is a very useful 600+ litres of hot water for your use. Neat, energy efficient, robust, enduring, and low cost. Regarding the post by Doug (13kW system), Doug is lucky – here in WA, where what we are allowed to install, is controlled by the electricity monopoly companies (one company for dirty electricity generation and transmission, and one company for billing for the dirty electricity), we are restricted to having no more than 5kW clean electricity generation capacity per household. I do not know whether the software involved, has provision for it, but numbering of messages would be useful, especially when referencing a previous message or messages. Great review, I love your honest opinion. The 20% efficiency you spoke about, you must be referring to the efficiency of the solar panels? If efficiency was measured this way no PV system would be over 20% and some systems being even less efficient depending on the solar panels and inverter used. All efficiencys are measured as a conversion efficiency to see how much energy is lost in the conversion process. The 20% efficiency I referred to is simply the efficiency of my car. It is about 20% efficient at turning the chemical energy in petrol into forward motion (or sometimes backwards motion). I expect the Sun Flux operates reasonably close to 96% efficiency as it lacks the heat sinks that would be necessary to dissipate waste heat if it was really inefficient. Thanks for the information on your personal experience with the Sun Flux. I appreciate it. I am considering a Sun Flux system for a new house in Byron Bay with an unshaded north facing roof, and I must say the whole package and concept strikes me as very smart. I was looking for an alternative to thermal hot water as our roof is very high and awkward to access and I dont like the idea of the inevitable repairs to a solar hws being done at such a height. I’ve been surprised not to find more reviews or comments on the Sun Flux online, and I wondered why that should be? Maybe because they have only been on the market for a couple of years? Are you still happy with it and do you have the one with the manual off-grid/on-grid switch? When it comes to a Solar PV system I would be researching those that offer micro inverters which can be installed with N, NW and NE orientation. This type of systems provides a cost effect upgrade path should you choose to optimise your system based on actual experience. We have just upgraded our Enphase system with 7 x 320w Panels to a total of 30 Panels 7.99 kW. We produce on average between 4 and 5 kWh per 1 kW system size. It is quite easy to find out what systems at your postcode are currently producing. As for Hot Water I would be inclined to do some research on Evacuated Tube Panels on the Roof Hot Water Cylinder at Ground Level. You could have the hot water booster timer switched to only access PV power when it is being produced and always on power for the circulation pump connected to the General Tariff. Our hot water cost with the exception of the circulation pump [not always running it only. As pumps when the water in the tank is less than 50c and the water on the roof is more than 50c] is negligible. Neither system require roof top maintenance and should have a useful life of at least 15 years. The other important issue is on line real time system reporting which is useful when making power management decisions. As for PV without Solar our annual cost would be $3,200 with our current Setup $600.00 Hot Water Nil. I have no experience with Sun Flux or even heard about them for that matter. Anyway you pay your money and take your chances. An attractive feature of electric storage systems is the option to adjust maximum water temperature, something apparently not possible with instantaneous and heat pump technology. I’ve long been frustrated by the lukewarm output of systems with non-adjustable tempering controllers. I also spoke about a low efficiency systems: wrt the diversion of grid-feed energy, this is a really lossy system, but when the alternatives are considered, in my case as a new install, it is cost effective to ignore the losses. I have a solar Edwards HWS on the house I am living in, that is 25 yo. Still reliable, but the panels need stripping & cleaning (Lichen growth inside the glass) The system still works fine tho. The simple storage HWS, with a suitably overszed PV system + the electronic diversion switch is still cheaper than the direct heat systems including installation for a new build. To put figures on it, for 2 units, I spent $1000 per hws ($2K total) + $9500 for my PV system fully installed + $800 for electronic switch. If I had installed a ‘wet’ HWS, I would have lost roof space for PV panels, & I would have been up for say $5K for a much smaller PV system + $3500 x2 for 2 solar HWS + installation, then I would have needed to maintain that extra roof complexity as well. My solar system will easily pay for itself in about 4 years, so the ROI is pretty high! Why are you heating water with electricity? You should be heating it with a solar thermal panel. I guess it is because you can. PV is the lowest prices it has ever been but as prices climb back up it may not be so cheap to heat water with electricity. Also heating water with solar thermal is MUCH more efficient. PV is only about 17% efficient so it takes a lot of roof space to heat hot water using PV electricity. I can easily get 80% of my hot water needs form 2 – 4′ x 10′ solar thermal panels. The rest comes from my 5 kW PV array. My back up heating element is 4.5 kW but because my water is preheated with solar the heating element is not on very long. THanks. I thought I had covered the cost/efficiency in my comments. My property is a renttal property, so having reliable, low maintenance systems wil save in the long run. I have a solar-thermal Solar Edwards at home, & it has been reliable, but the installation costs are higher than being able to have the cylinder close to the main usage areas as is the case in an electric storage cylinder. I know the efficiencies are lower, but because my solar system is oversized, I can use excess power at no effective cost. (Even on overcast days my system limits to 5Kw, which is my grid limit). So, to summarise: I have no water piped to the roof for hot water, my system is totally silent (something improved on the newer Heat Pumps), & I have no pumps tc to maintain. So there are alternatives. The choice is up to you. OK John, working in your units (imperial) I calculate that your Solar Thermal solution is most likely to be capable of servicing a large 505 Litre @ 60 Deg C, HWS (4.54 x (80/(1.15 x 8.34 x (140-50)/1200))). I am curious about the collector sizes though; 10 Ft is a long one for domestic systems. I have said that I know using PV to heat water is inefficient. The cost savings come because I only have one technology on the roof, so in the long term, less maintenance costs, plus lower installation costs, making the total economical. Also once the water is hot, the excess goes to the grid (& because I am using 2.4Kw (x2 for 2 HWS) elements, I will still have grid export at peak generation times. As I said, I know the costs, & I feel this is the best option for ME!. W.A. agent informed me today that due to repeated concerns about the two yr warranty that inventor has agreed to extend it to 5 yrs. Quoted price of 1290 for either unit (no panels). I have some surplus panels . SF1 annd SF2 have been replaced by Sun Flux new gen.
You can get STCs on the panels if installed by an Off Grid licenced installer so economics are better than above article. I am getting one with a 250l twin element replacing instant gas..
Time for an update article? The SF1 and SF2 have been replaced by SUN FLUX new-gen. If installed by an “off grid” ticketed installer STCs are applicable. I want to swicth 240v on or off with a timer, and add solar to my hot water tank. I have a Aquamax 80Lt with 1.8 Kw element. What will I need to do this job? A timer is not expensive but the law requires an electrician install it. The only exception is for some small water heaters that are plugged into a normal power point. In this case you can buy a plug in timer from a hardware store and use it. But while an 80 liter tank is not large, I think it is likely to be hardwired in and so you’ll need a sparky. John’s answer was correct. If you want your hot water heater/booster to have access to solar you will probably have to move its power source from the hot water time of use tariff to the general tariff [if that is the current]. That means that your hot water service will be totally reliant on Solar Power. I am not sure if in the case of hot water the main heater and booster elements are on seperate circuits in which case you have a choice as to which has access to solar power. The sparky can do this at the time. You will need to record the hot water metered kWh value on the day date that it is done to ensure that you next billing in kWh is correct. Energy Distributors/Suppliers are now inclined to estimate consumption over two or three billing cycles rather than actually read the meter. 1. Off-peak Tariff 62 which is supplied overnight only. Cost is 12.754 cents / kWh. 2. Off-peak Tariff 61 which is supplied overnight plus also 2.5 hours in the afternoon. Cost is 13.541 cents / kWh. 3. Tariff 41 which is widely known in Tasmania by the marketing term of “HydroHeat” (a reference to the Hydro-Electric Corporation (aka Hydro Tasmania) and not to hydronic heating). This is a 24 hours / day constant supply and is available for storage water heaters and any hard wired space heating appliance with an *output* capacity of 3.5kW or greater and installed in the main living area of the house. Water heaters are limited to an *input* power of 16 Watts per litre (so a standard 250 litre / 3.6 kW is fine). This is by far the most common means of heating water in Tas and the cost is 16.819 cents / kWh. 4. The final option is the general supply Tariff 31 which is intended for general power, lights etc. There’s no law precluding use for heating water but nobody does that given that Tariff 41 is a 24 hour / day alternative at a substantial discount with some very easily met conditions. The price for this rate is 25.9 cents / kWh but as I said, practically nobody heats water this way in Tas. So your “third cheapest” option in Tas should be Tariff 41 at 16.819 cents / kWh and not Tariff 31 which you have used. Alternative option is Time Of Use (TOU) metering. This provides 16 hours per weekday and all weekend at 14.577 cents / kWh and the remaining 8 hours on weekdays only (7 – 10am and 4 – 9pm) at 31.307 cents / kWh. Households using this rate will have all power supplied via this meter (that is, they don’t also have any other tariffs installed). Obviously anyone sensible would heat water at the cheaper times which is easy given that’s a rather long period with the daytime window, 6 hours, and the night period both individually being sufficient to heat a completely cold HWS to 70+ degrees so no issues there. These rates are all “fixed” prices and not negotiable noting that there is no choice of retailer for residential consumers (but nobody sensible is going to argue with a 24 hour supply covering their two major energy uses, space heating and hot water, at under 17 cents / kWh). So just thought I’d set the record straight. There’s no reason for anyone in Tas to be paying more than 16.819 cents / kWh to heat water in a tank. Thanks Ronald great article. So many people selling and buying stuff that never pays for itself! I think domestic battery storage also falls into this category at present, but I guess early adopters help to get products moving and bring the price down. SolarEdge have a good product that uses excess PV from a grid connected system. It produces variable voltage ac to absorb only the excess power going back into the grid and works really well but only works with the SE inverter. Hoping that a similar product may be mass produced that can work with any PV system and any hot water system in the future. It’s a no brainer and I can’t understand why inverter companies haven’t pusued it. SMA used to have their “Smart Load” which was an inverter that did the same thing, but they’ve dropped the product unfortunately. There is an Open Source project that is part of the OpenEnergy project, called the Mk2PV, that measures the export & triggers a Triac or SSR to dump the excess to a resistive load (such as a storage water heater). The boards are now available assembled, but need to be fitted in a case.